- Remind you that Jesus is with us in every hard thing. In the 5 years since I started this blog my life has changed. The media landscape has changed. The life I imagined for myself has changed. Last month after another scan our oncologist told us there is only a 2% chance of Xylon’s cancer recurring. Thank you, Jesus! It feels like a new start for us. There were so many other new starts for me since I started blogging here. I’ve changed jobs twice. Last year, I left full-time employment to start an agency providing communications services to nonprofits. I’ve moved towns, renovated a home, taken on two dogs, run 7 half marathons. 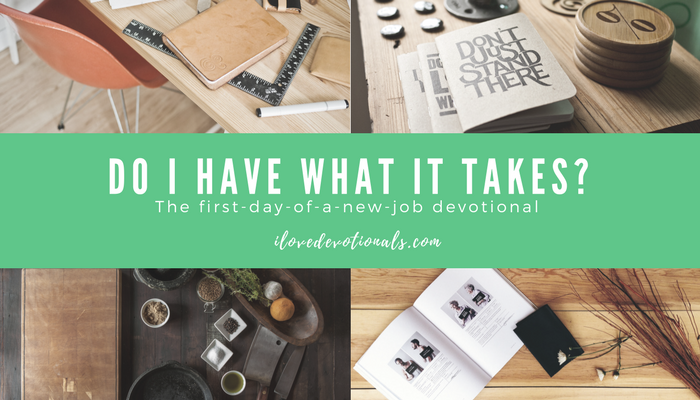 Some of the changes and new starts I’ve shared here and some I haven’t felt fitted the confines of writing devotionals. I haven’t known where to put that stuff. Slowly I’ve pivoted my twitter and LinkedIn profiles to share my broader interests but I’ve left Facebook and this blog with a narrow focus. More and more I find the things that God is putting in my heart are about living mercy and justice and walking humbly with him (Micah 6:8). And as a Christian, and a white South African, I’m finding that means more and more speaking up about racism, prejudice, and inequality. Even when those conversations are hard and uncomfortable and messy. Maybe especially then. These are topics are only things that challenge me personally and the wider Christian church but they are also the things the nonprofits I work with care deeply about. 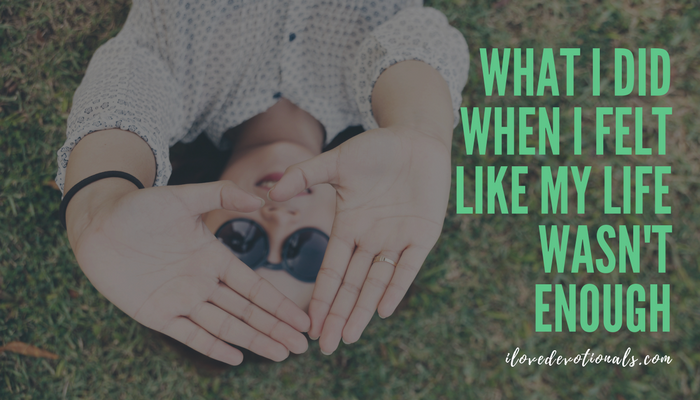 I try to live a life where the values I learned from Jesus aren’t separated from my everyday or work life but the more I think about it on this blog and my Facebook page I’ve many times kept the every day out of the spiritual. 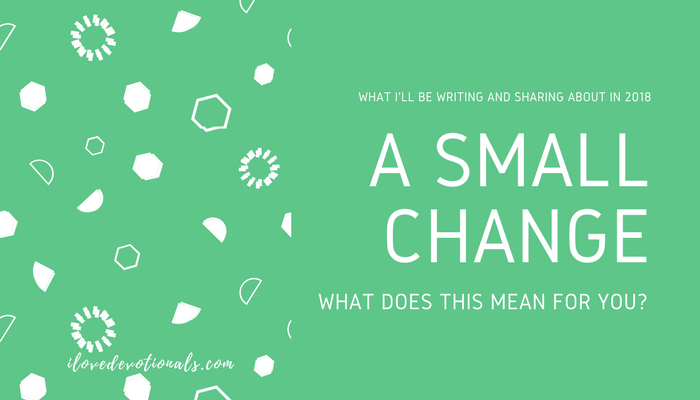 For almost two years now, I have struggled with what to do here on the blog and on Facebook and at the end of last year, I felt like maybe it is time to do a small pivot. I will still be writing and sharing here. I’m setting a goal to share a devotional or prayer here once a month. I know my posts have been infrequent and I will try to improve on that. From time to time, I might share guest posts or books I’ve been reading. 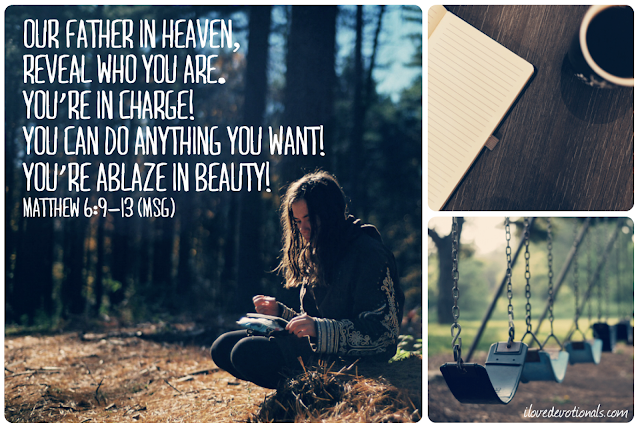 If you are a current subscriber to this blog you will only receive posts I share on ilovedevotionals. If you don’t want to miss a post, you can subscribe here. It means that I’ll be sharing more broadly on my Facebook page so if you follow me you’ll see posts about devotionals that I’ve written for this page but you will also see links to posts I write for ibelieve, quotes or bible verses that encourage me. You will also see me sharing posts I write on how to grow a nonprofit cause or fundraiser. Then from time to time, I’ll share interesting articles or videos that I find online and I think add value to discussions about racism, prejudice, and inequality. If you aren't following me on Facebook you can like my page here. Thank you for joining me over the years as I’ve shared my journey of walking with Jesus. I hope as I walk this new path that we can continue to go together. It’s my first day at my new job, my new business really. It’s a month since I left full-time employment to pursue the life that I want. I just told Xylon there are butterflies in my stomach and I am so nervous for my first day at work, I mean in my own business. To make enough to cover the bills. I sit googling Bible verses about having what it takes. So I stop googling and I print the verse out. I resist the temptation to make a pretty design with it. There is work to do. I print it and paste it on the edge of my computer screen. Later, I find a highlighter and I stretch green over the words I need to be reminded of. Today, this promise will remind me that I have what it takes, not in my strength but because God is with me. Today, this promise will be enough. Prayer: Thank you, that you are with me today, and every day. When I feel like I don’t have what it takes remind me to be strong and courageous and do the work you’ve given me. Renee Fisher is one of the first people I connected with online. Her friendship has been a great source of encouragement. I've followed her ups and downs and seen how through it all she never stops dreaming or helping others achieve their dreams. She launched her tenth book, Unløved, a short but powerful eBook that empowers women to find freedom by embracing their inner critic last week. You can purchase it on Amazon for $2.99 here. I asked her if she'd mind me sharing a short expert and she kindly agreed. I hope you are encouraged by it. Seasons change. I never realized the spiritual significance of the changing of seasons until I learned how to cultivate a life of my dreams. It doesn’t take much effort to walk outside and determine if it’s going to rain that day. It does, however, take time to learn how to pray and read the Word to determine which spiritual season you are in. Your ability to praise the Lord despite your circumstances or unmet desires has the power to awaken your dreams, including the dreams of future generations. Dreams, like seasons, change often. 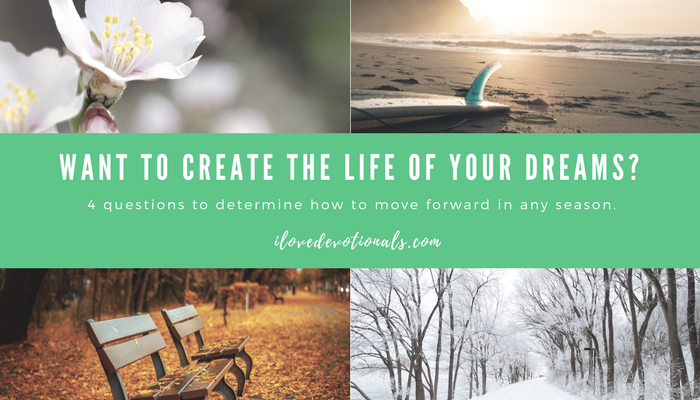 If you are unsure how to cultivate a life of your dreams, ask yourself these four questions to determine how to move forward. 1. Summer: My dreams are ripe. Even in the heat of summer, we can relax and take a much-needed vacation. We can taste and see that the Lord is good (see: Psalm 34:8). 2. Fall: My dreams are harvested. We can mature and save up for the winter season knowing that we are rooted and grounded in love (see: Ephesians 3:17). We can choose not to be moved away from the hope of the gospel (see: Colossians 1:23). 3. Winter: My dreams are not dead. Winter brings a much-needed break, although it might feel like coming to a screeching halt. We may feel uncomfortable with the process of solitude and silence, but it will help us uncover what’s in our hearts. To admit, like Elijah, the answer to the question, “What are you doing here, Elijah?” (see: 1 Kings 19:9, 13). 4. Spring: My dreams are newly planted. We may not understand, at first, that the storms and rain are actually a blessing to drive that tiny seed deeper and further under the soil to die so that it can come back to life. We can plant in tears knowing we will harvest with shouts of joy in a future season (see: Psalm 126:5). Spiritual seasons can be tricky. It took me almost an entire year to realize I was in a winter season last year in Houston and to acknowledge that my dreams were not dead—just waiting for spring. Now in Austin, I thought that my dreams were coming back to life, only to have a mound of dirt piled on top of me so these baby dreams can grow for a later harvest in a future season. It’s so complicated that I sometimes feel like giving up. Will my desires ever be met? But, if I’m honestly asking myself that question—I already know the answer. Of course they will! God has been faithful before and He will again. I don’t know what season you are in or how freeing or frustrating it may feel. But don’t quit! Don’t run away! You can bloom where you’re planted. “There will always be flowers for those who want to see them.” There will always be dreams for those who want to live them. If you'd like to read more of Renee Fisher's work buy Unløved now for $2.99 or visit her website reneefisher.com to find out how she can help you call your dreams to life. In April, I quit my job. In May, I quit using social media apps on my phone. I didn’t expect the anxiety deleting my social media apps would cause. I wrote about my journey to what I call now digital minimalism on iBelieve.com this week. 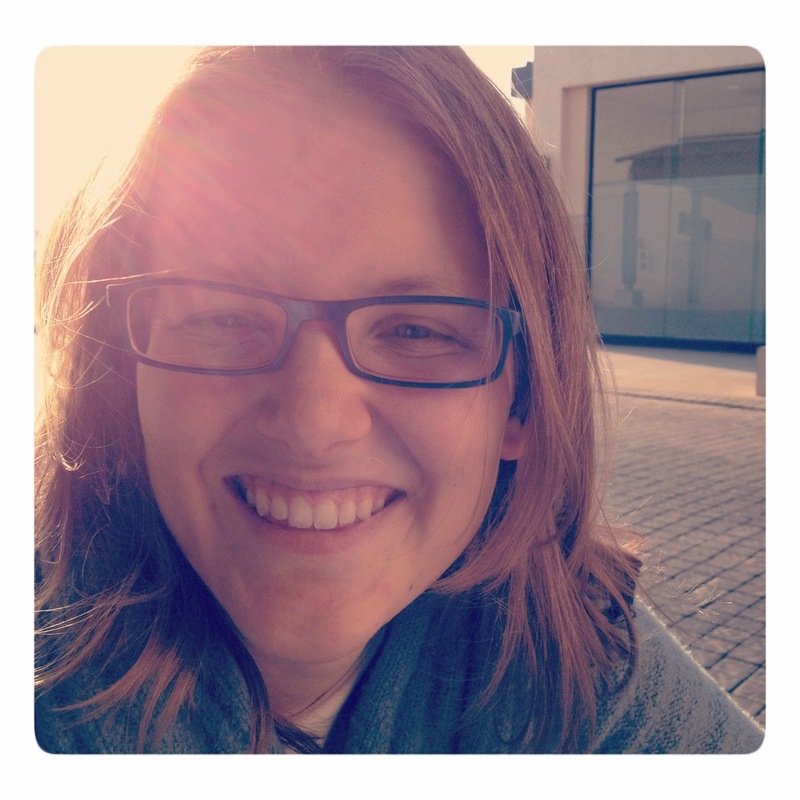 I want to share something here about it that I didn’t share in the post on iBelieve. I loved going on Instagram before I deleted the social media apps. If you’d asked, I would have told you it was my favourite social app. I found the pictures soothing and enjoyed quick glimpses into my friends and families lives. After deleting the apps, I’d go on Instagram from time to time and scroll through the pics. I started to recognise a feeling I hadn’t expected each time I opened it: discontent. I’d scroll through a few pictures and feel so discontent with my life. I’d see pictures of people travelling and wish it could be me. I’d look at friends spending time together and wonder why I wasn’t there. Photos of meals I’d love to eat, pictures of places I’d love to run through…The list was endless. I would close the app and sit there feeling like my life isn’t enough. I didn’t like feeling that way. One day after opening and quickly closing the app after the bubbles of discontent floated up I sat and thought about what was happening. Was I really discontent with my life? Were these feelings real or were they a reaction to using the app? I thought about how I felt before I went on Instagram. I felt like I had the best life. I felt content with my life. I go on Instagram less and less. Before I quit using social apps on my phone, it was a couple of times a day. After, it was once a week, then once a fortnight and now I can’t remember the last time I went on. Part of me has wondered if choosing to stay off Instagram is the coward’s way of learning to be content in every situation. This verse helped me realise that we can choose contentment. That is what the “Instead” signifies to me. “Instead” means to do something in preference of something else. It means I can choose going outside over going online. Instead, has become a powerful word for me as I pursue digital minimalism in my life. I could feel discontent instead I thank God for everything he has given me. I could feel alone instead I remember God is Emmanuel (God with us). I could feel worried instead I look at the Sparrows and wonder at how God takes care of them and me. I chose this translation of Psalm 16:11 because it reminds me that when I choose to look to God instead of dwelling on my feelings, my actions lead me toward a beautiful life of true contentment. Some translations write this verse as “In your presence is fullness of joy”. Isn’t that a great description of contentment? It happens like clockwork every time Xylon has a PET scan. This year was no different. 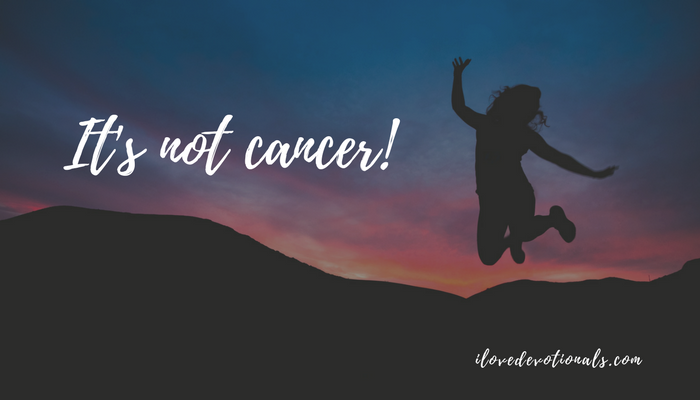 A week later, we sat in the oncologist’s room while we planned out the next steps. An operation to remove the lymph nodes that had grown followed by a biopsy. We scheduled the operation for the middle of August. After Xylon would have completed his big cycling goal for the year: a 230 km mountain bike race. With his muscles still tender after the race, I kissed Xylon and watched the porters wheel Xylon into surgery. I still felt peace. Usually, by this stage of the process, I am in knots and wondering what will happen to us if the cancer is back for the fourth time. The surgery went well and the surgeon tells us he should have the results in about a week. We’re both still calm. Our mustard seed faith is still carrying us through. The nursing sister asks if I’d like her to share the results with me. I’m sure she said something else but I didn’t hear it. I say goodbye and run through to the bathroom. Later, we go out to celebrate at Xylon’s favourite restaurant. We celebrate because we know that life is a gift, and growing old is a privilege not everyone has. We celebrate because we’re so thankful that God has healed Xylon. We don’t know why he healed him when others cries for healing go unanswered. We wrestle with that a lot. Truly God is good to His people, Israel, to those with pure hearts. Though I know this is true, I almost lost my footing; yes, my steps were on slippery ground. For they seem to live carefree lives, free of suffering; their bodies are strong and healthy. They don’t know trouble as we do; they are not plagued with problems as the rest of us are. But look at this: You are still holding my right hand; You have been all along. Even though I was angry and hard-hearted, You gave me good advice; when it’s all over, You will receive me into Your glory. For all my wanting, I don’t have anyone but You in heaven. There is nothing on earth that I desire other than You. I admit how broken I am in body and spirit, but God is my strength, and He will be mine forever. But the closer I am to You, my God, the better because life with You is good. O Lord, the Eternal, You keep me safe— I will tell everyone what You have done. I know so many of you follow this blog, and Xylon's story, and have prayed for us, so I wanted to tell everyone what God has done (again). I hope that it will encourage some of you who are also living through impossible situations that God is still able.